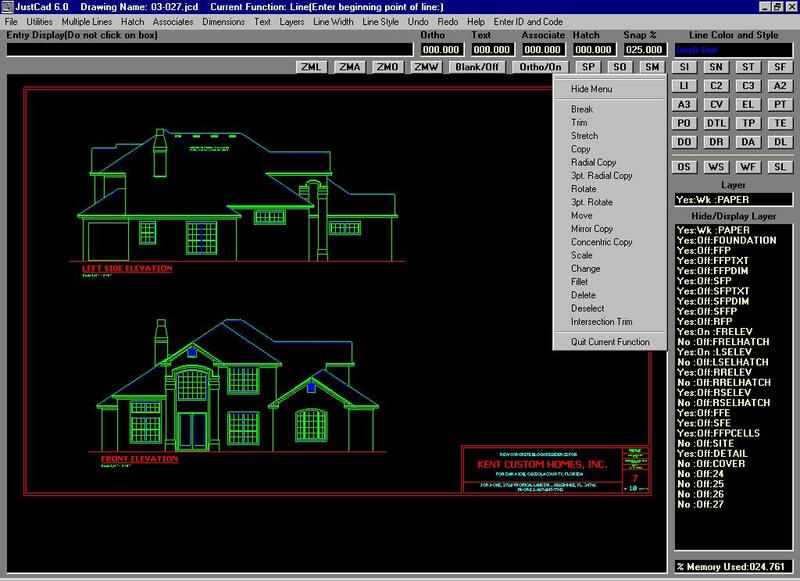 CAD Drawing Software - JustCAD is designed, to make CAD drawing as simple as possible.To draw any object, simply click on the screen or snap to an existing object, move the cursor in the desired direction and enter a distance. To change an angle setting for any function, simply click on it's display box and enter a new value. Draw confined to an angle or free cursor with a simple click on the display. Define an Associate, hatch or multiple line by drawing the desired pattern, select it, enter a name and enter the prompted for reference points. Edit multiple objects with a few clicks on the screen. There is no setup for each drawing. Just draw. when your drawing is finished, select all or a part of it, click on the print menu, enter a scale and print. Drawing tools include, line, 2pt. circle, 3pt. circle, 2pt. arc, 3pt. arc, curve, ellipse, point, polygon, linear dimension, radial dimension, angular dimension, leader, text place, text edit, associates, hatch, multiple lines, ortho on/off. 3 arrow styles, (dimension in feet and inches, feet, 3 place inches, 3 Place Meters, 3 Place Centimeters, 3 Place Millimeters, Comma Metric), unlimited layers, 8 line widths, 5 line styles, blank line, snap to (point, object, midpoint, percentage, intersection, perpendicular, tangent) and more. Edits include, break, trim, stretch, copy, radial copy, concentric copy, move, rotate, fillet, 3pt. rotate, 3pt. radial copy, change properties, scale, erase, (undo and redo 40,000 operations). Utilities include, Measure distance, measure area, measure angle, total length selected, 2 circle tangent line functions, insert text file, import and export dxf format files. Actual Drawing - A visual Web authoring tool, which helps you make Web Pages without having to know HTML. Site license for Actual Drawing Deluxe - a visual web authoring tool that helps you make Web Pages without having to know HTML.